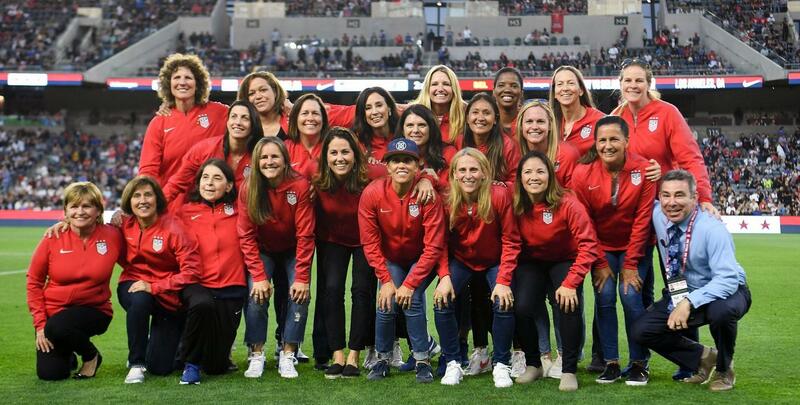 San Ramon's own Tiffany Roberts Sahaydak, a member of the 1999 USWNT World Cup Championship winning team, was one of the players honored at a pregame ceremony on April 7, 2019, in Los Angeles. An alumna of San Ramon FC, Tiffany Roberts Sahaydak was one of the players honored at a pregame ceremony on Sunday, April 7, 2019. The event celebrated the 20th anniversary of the USWNT's 1999 team that won the FIFA Women's World Cup. Roberts Sahaydak, who grew up in San Ramon, and her teammates - Mia Hamm, Brandi Chastain, Julie Foudy, to name a few - are widely credited with changing the landscape of youth soccer for girls, paving the way for today's generation of USWNT stars. The 1999 team's World Cup victory was seen as a milestone moment for the rising popularity of women's soccer in America. Roberts Sahaydak currently resides in Florida with her husband, Tim Sahaydak, and their two children. She is the head coach of the women's soccer program at the University of Central Florida. You can read about the ceremony, which was held before the USWNT vs Belgium friendly match, on the CBS Sports website.